In the spirit of inaugurations, I thought I’d talk a bit about who we are in our inaugural blog post. Victoria Concierge (VC) is a family business started by myself (Maki) with the support of my husband Chris. We moved to Victoria from Toronto in 2004 after the birth of our son. It was purely a quality of life decision; clean/fresh air, no traffic and great weather are just a few of the ‘qualities’ we like about Victoria. 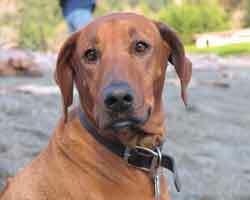 We are blessed to have two children, they love to run around at a beach and a lake, climb rocks in a forest and our dog ‘Saku’ (in the picture above) is a Rhodesian Ridgeback. She loves living in Victoria too – except for the salt water. It was pretty funny the first time she drank from the ocean. I’m still a full-time Mother by choice as our youngest isn’t in school yet. And I wanted to continue my career, but not sacrifice spending time with my children in their formative years, so I decided that starting my own business was the best way to go. It offers the flexibility to work as much, or little, as I want (sort of) while generating an income and doing something I love and am good at. In researching the various options and analyzing my strengths I kept coming back to some sort of service based company and voila – Victoria Concierge was born. VC is more than a simple business endeavor, it’s my form of activism. If you visit our office or look on our shelves you will see that in addition to organic food, we use only 100% natural, non-toxic cleaning products. We extend our philosophy beyond our home as we strive to educate ourselves our children and our community about ways to minimize waste and soften our impact on the earth. We endeavour to use only recyclable products in delivering our services and we compost everything possible. 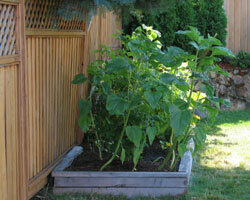 We have a small (5′ x 16′), but growing, organic garden in our back yard and our goal is to grow 25% of everything we consume. Easier to do in the summer of course. Our philosophy permeates the way we approach our work, treat our staff, choose our partners, and provide service to our clients. All of which I probably could not have acheived working for someone else. So far I’m very happy with the somewhat modest results. We have a few (very happy) clients that we can focus on and still have plenty of time to spend with the family.